This utility installs the Sony Headphone Amplifier driver. This driver is necessary to connect to a Windows® computer. Note: Please make sure all the latest Windows updates have been installed. Note: This software is not guaranteed to work for all computers, even if they meet the above system requirements. IMPORTANT: Please do not connect the Headphone Amplifier to the computer until instructed. If you have already connected the device to the computer, please disconnect it now. At the File Save dialog box, download the Sony_Headphone_Amplifier_Driver_Setup_V1.0.0.zip file to your desired location on your computer. (please note this location for reference). Note: Please do not connect the Headphone Amplifier to the computer until instructed. If you have already connected the device to the computer, please disconnect it now. Go to the directory where the file was downloaded and right-click the Sony_Headphone_Amplifier_Driver_Setup_V1.0.0.zip file, and then click Extract All. Note: For Windows 8/8.1 and 10, the default settings for Internet Explorer® will save the file in the Downloads folder. For Windows 10, use File Explorer to locate the Downloads folder, the default settings for Internet Explorer® will save the file in the Downloads folder, for Windows 8/8.1, click the Desktop tile from the Start screen and then locate the downloaded file using Windows Explorer. A new file will be created called Sony_Headphone_Amplifier_Driver_Setup.exe. At the User Account Control screen, click Yes or Continue. At the Choose Setup Language screen, select the language you wish to use, and then click Next. 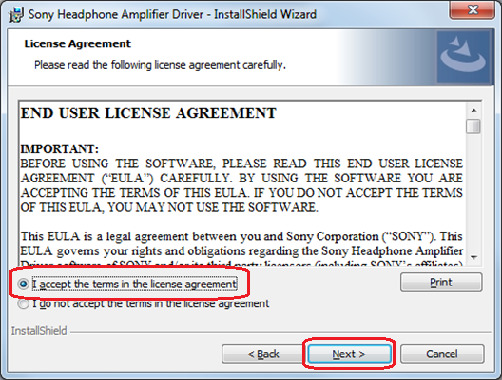 At the Welcome to the InstallShield Wizard for Sony Headphone Amplifier Driver screen, click Next. The Installing package Driver (x64) screen will appear. 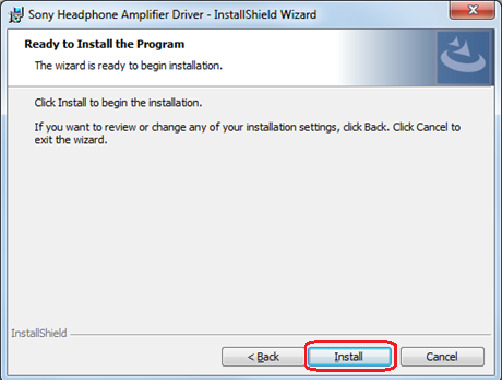 At the The InstallShield(R) Wizard will install Sony Headphone Amplifier Driver on your computer screen, click Next. At the License Agreement screen, read the text and if you agree, click to select I accept the terms in the license agreement, and then click Next. The Sony Headphone Amplifier Driver will be installed. At the InstallShield Wizard Completed screen, click Finish. At the The InstallShield Wizard has successfully installed Sony Headphone Amplifier Driver screen, click Finish. Connect the Headphone Amplifier device to the computer using the supplied USB cable. Power on the Headphone Amplifier device. On the Headphone Amplifier device or the included remote control, push INPUT button repeatedly until PC (USB-B) appears in the display window. If installation procedure was completed correctly, the Headphone Amplifier (TA-ZH1ES) will appear as a device in Device Manager under Sound, Video and Gaming controllers. If the TA-ZH1ES does not appear as a device in Device Manager, restart both the Headphone Amplifier and the computer. Once both have restarted completely, check in Device Manager again. 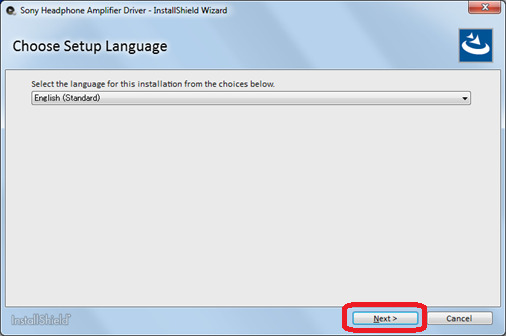 If, after restarting both the Headphone Amplifier and the computer, the TA-ZH1ES still does not appear as a device in Device Manager, the driver installation procedure has failed. Click Start, click Control Panel, click Uninstall a Program, click to select Sony Headphone Amplifier Driver and then click Uninstall. Once the uninstall procedure is complete, download and install the driver again.